It’s sort of amazing how fast the Google(s goog) Cloud Platform has gone from not-really-there to a contender for Amazon(s amzn) Web Services’ public cloud mantle, at least in terms of perception. The consensus from an unscientific survey of cloud watchers, is that Google is the one company with the engineering wherewithal and cloud focus to create and deliver innovative services on par with what AWS has done and continues to do. 2: Churn out more managed service-y services. These are the sorts of things developers use but without having to twiddle all the underlying knobs. Google has already trotted out Google Cloud SQL (vs. Amazon RDS?) and Google Cloud Data Store (vs. Dynamo DB.) And don’t forget Google App Engine and it’s PaaS-like capabilities. But it needs more such dev-friendly services if it wants to unseat AWS as the developers’ favorite cloud. Search is what Google is really, really good at. If it could manage to bring killer search to Cloud Storage, Cloud SQL and Cloud Datastore, “it will have one up on AWS,” said Gigaom analyst MSV Janakiram. Google Compute Engine will “eventually support shared storage with concurrent read/write ability which will be a big deal,” he added. No disrespect to Google Senior Vice President Urs Hölzle or director of product management Greg DeMichillie, but compared to AWS CTO Werner Vogels, ubiquitous blogger Jeff Barr, and AWS Senior Vice President Andrew Jassy, they’re just nowhere near as visible. Google needs more — or at least louder — cloud evangelists. Oh, and more marketing. If Google could offer live instance resizing — admittedly a difficult technical task — it would be a huge differentiator, said Sebastian Stadl, CEO of Scalr, a cloud management company. He also thinks lowering the cost of on-demand instances to meet AWS reserved instances could be a game changer. 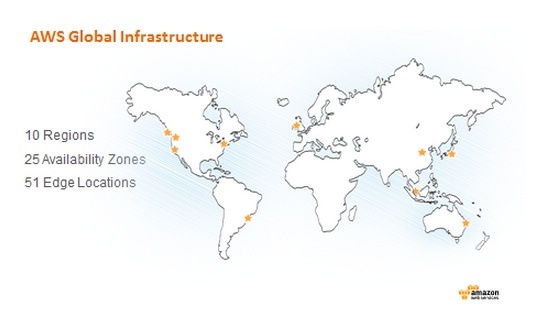 Google has more regional data center coverage at least in Europe and needs to publicize it. AWS, famously, has one European region operating out of Dublin, along with several edge locations while Google has data centers in Finland, Belgium and Ireland. I mean really, one AWS region for all of Europe? That sort of begs disbelief. That’s probably not going to be the status quo for long but in the meantime, Google has to toot its own horn. AWS already lets you pump your virtual machine images in and out of its cloud. If Google wants to win over some of those workloads, it needs to add that capability to its cloud. Easy entry (and easy exit) is a big thing in cloud. 8: Do all of the above but faster. Google has rolled out a ton of stuff over the past year, but AWS has a seven-year head start, so Google Cloud needs to do more, and do it faster. The company has the technical chops and the resources to build all this stuff. Now it has to get cracking to deliver more of it ASAP. One thing is true of Amazon Web Services: It’s a moving target. I hope Google Cloud take Amazon AWS out piece by piece as Amazon took technology developed from their AWS subscribers and copied it for their profits. The technical discussions are really interesting, and I think Randy is correct that high speed networks could effect how business is sorted out in the Cloud. I’ve wondered about another kind of network effect and how it operates in the Cloud business. Is there a certain amount of data, a certain number of S3 objects at which the Network Effect trumps other logical, technical advantages. Are enough firms connected to AWS via Direct Connect, that at this point switching is more costly than transient differences in billing increments? How much does the mid-market and enterprise actually care about billing increments when virtually none of them can autoscale their infrastructure, let alone leverage spot instances. I have no doubt a strong number two will result in changes in market share. I wonder if it will be AWS that feels the presence or the weaker offerings, and the premise of Private Cloud. Google entering the public cloud business essentially accelerates enterprise adoption of Cloud, by providing two strong options. Given the trillions of api calls and observations of how customers use the Cloud I feel AWS web services the customers quite well. Based on working with enterprise customers and mid market my assessment is that firms have already made a huge investment onbooarding to AWS and at this point their spend continues to grow. For an enterprise to standardize on something is significant. I’m not certain other vendors have any where near the effect on AWS that AWS may or may not signal. I doubt AWS will telegraph any meaningful information to competitors. I did think it was telling that AWS moved decisively to plow salt into the cloud cost analytics space. Usage data is not something any Cloud vendor wants to share with competitors. Cloud. Yeah, let me keep my stuff on some computer that only God knows where it is, and who’s running it. I’m pretty sure it’s totally secure from prying eyes,…. (insert NSA here). Some bandwagons do not need jumped on….. Your concern is a pretty big driver for private cloud (CloudStack, Eucalyptus, OpenStack), so that’s available to sensitive workloads too. An indiana Jones, outside of the public, nowhere. #9. Give it for free! If I’m not mistaken, you can get $2000 of free credits pretty easily (handouts at conferences like the excellent PuppetConf). That’s a nice start. With Amazon cloud predicted to be carrying 1 Percent of the total Internet traffic in North America and some of the fastest growing, hottest startups building their businesses on Amazon AWS, it is a uphill battle for Google to catchup with Amazon AWS any time soon. It will be interesting to watch how the competition plays out in the next few years. Doesn’t Snapchat run entirely on Google Compute Engine? That’s a pretty good stamp of quality right there. uhm, does anyone freak out because of followers? how about innovation? Despite what some say, cloud is in its very early stage, there is tons of opportunity for innovation. i expect that most first-rate market leaders including Amazon to be always watchful and wary of up-and-comers. remember Andy Grove and the importance of being paranoid? the fact that google is so huge and so successful makes it more than an upstart though so i’d expect AWS to be more than a little bit curious about what it’s up to. Having said that, yes, we’re very early on in cloud. I think that what Google has to do is simply develop tools that will allow Android developers to take advantage of Google Cloud Platform and Google App Engine. Given Google dominates the mobile OS market (Who said 60%?) I can guarantee you that Google Cloud will hit the sky like a rocket. They have pretty good tools so far. Google Cloud Endpoints offers a nice bridge between both Android and iOS (and web) clients and App Engine instances.